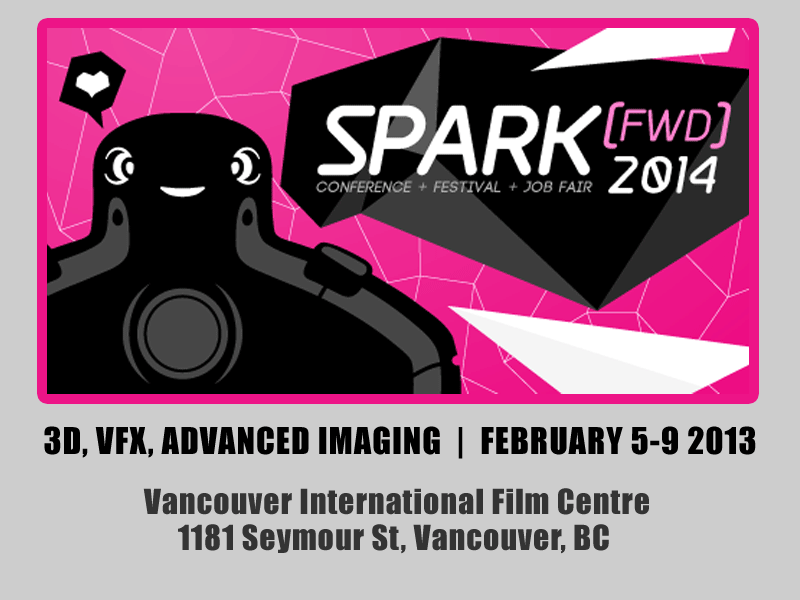 For its 5th edition, SPARK FX and 3D[FWD] are merging into SPARK [FWD] 2014. We will continue to bring you 5 days of events, including a job fair, a conference, and a film festival. The presentation series is complemented by film screenings chosen to exemplify innovation and excellence. If you are a filmmaker, producer, VFX artist, technology or CG enthusiast, this isn’t an event you want to miss. This new event encompasses VFX, animation, live action, HFR (high frame rate), Stereoscopic 3D and other advanced imaging topics. We are releasing a schedule and lineup of great presenters very soon. We can confirm that ILM, Weta Digital, Prime Focus World, Geneva Film Co, Christie Digital & Warner Bros will be present.With its eyes firmly riveted on the cutting-edge, SPARK [FWD] is also an opportunity to reflect on the past, and celebrate the achievements of some of the VFX industry’s most prominent pioneers. This year will be no exception! Come get your Early Bird Special before it runs out! You can now book your pass for the 3-day conference. It will run from Thursday February 6 through Saturday February 8 from 9 am to 6:30 pm. To book your reservation now, please go to the registration page. The Festival will feature films, special guests and screenings in the evenings. Stay tuned as more information is coming and is constantly being updated. We give you one-on-one time with studios. You’re not just handing off a resume and a reel. Check the registration page for more info. STAY TUNED FOR THE SCHEDULE, SPEAKERS, AND MORE NEWS! Thank you to our event sponsors, supporters and partners, especially Spark CG Society for making this event happen this February.